Fresh forest foraged Fall wreath. Say that 10 times fast! 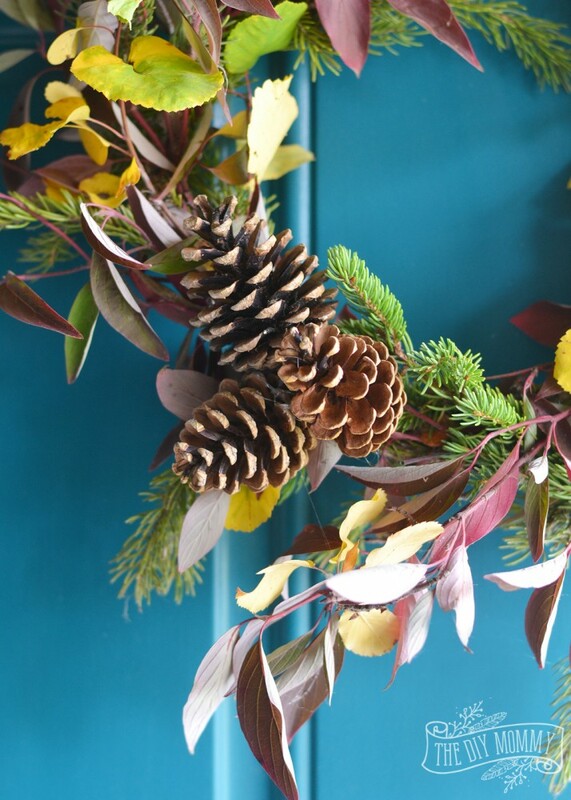 Today I have the exciting task of sharing a Fall DIY wreath idea with you along with a whole bunch of my favourite fellow Canadian bloggers. 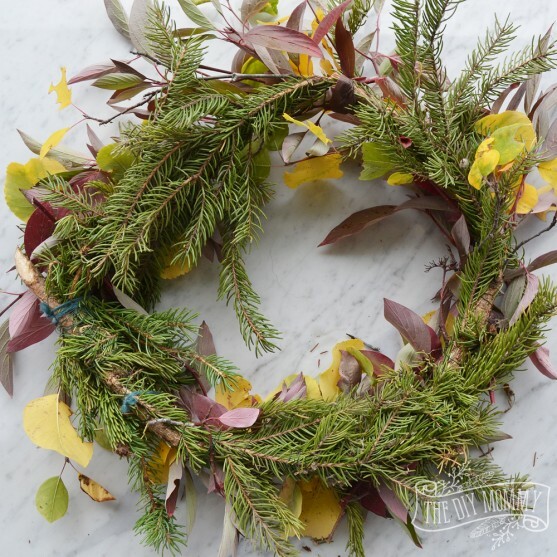 This Fall, I wanted to create a wreath from things I foraged in our backyard. Not only is it a cost effective way to go (um, free! ), but I think using nature in home decor is simply beautiful. I’m really happy with how my foraged Fall wreath turned out. It was really simple to make, and this project also makes a great activity to do with the kids. My three year old LOVED making this wreath with me. 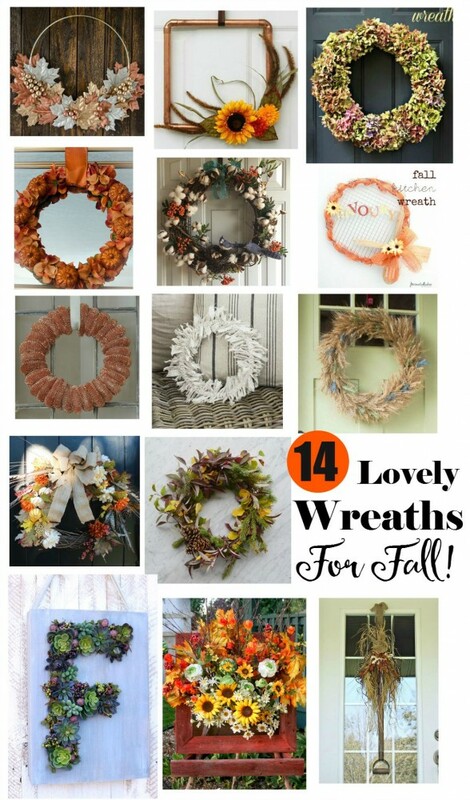 I hope you enjoy it too, and don’t forget to take a look at all of the lovely Fall wreaths my blogging friends have created at the bottom of this post! 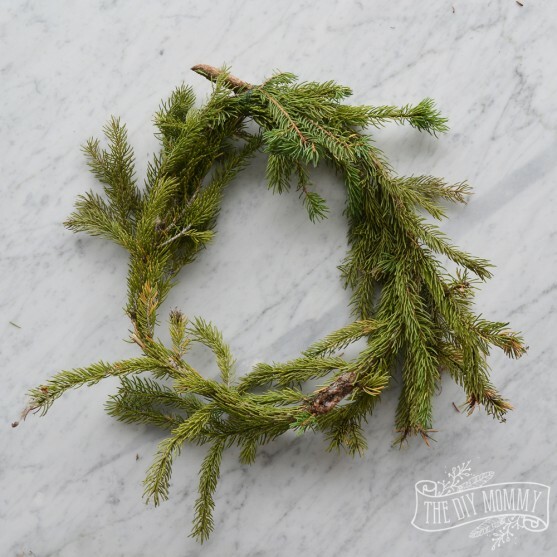 The idea for this wreath came to me as I was photographing pictures in our woods behind our home. What gorgeous Fall colours! I needed to incorporate this beautiful foliage in my Fall decor. Then, I thought of the evergreen wreaths my Mom taught me to make last Christmas. Her grandpa taught her how to make them, and I thought it would be fun to take the idea one step further this season. 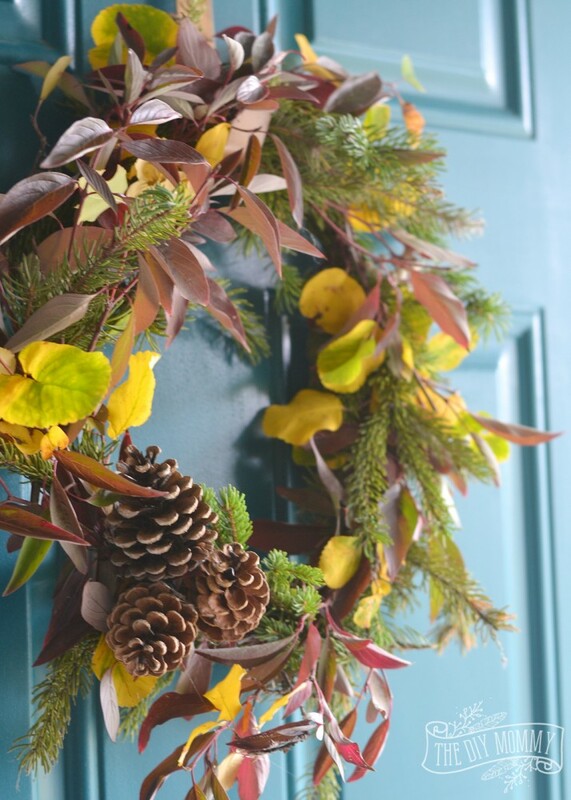 By adding some red leaves, golden leaves, berries and pinecones, I think this live wreath looks quite Fall-like. Don’t you? I’m hoping my Great Grandpa would be proud. 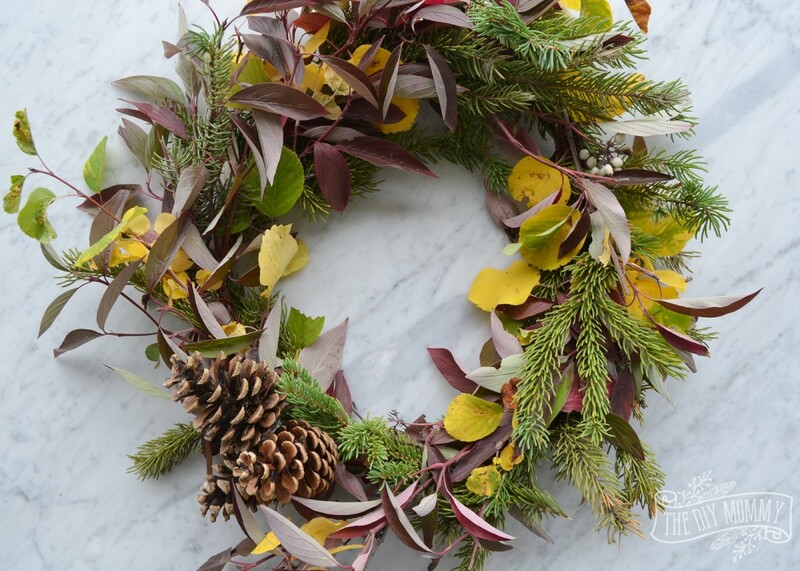 Here’s what you need to do to make this foraged Fall wreath. 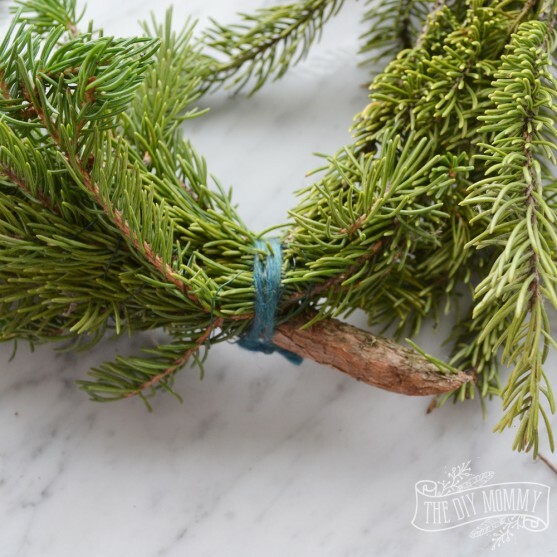 Carefully bend the Spruce branch into a circle, and secure the ends together tightly with a piece of twine. Obviously, the longer the branch you have, the larger your wreath will be. You can remove any unruly parts of the branch at this point. Trim your tree clippings into approximately 6″ lengths. 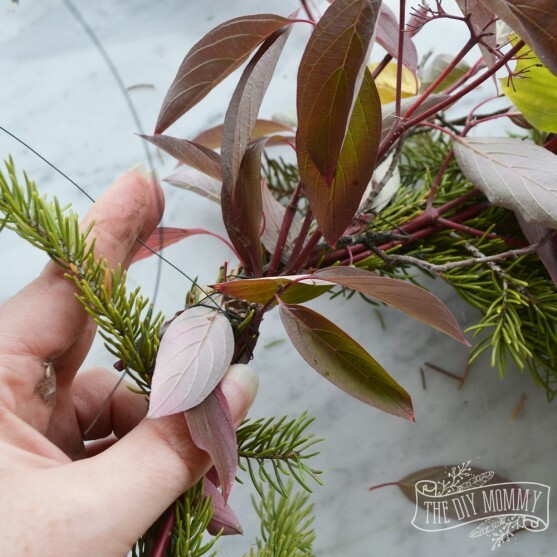 Secure a long piece of floral wire to the Spruce base (I tied mine), place one of the clippings on top of the base, and then start wrapping the wire around it. Be careful not to wrap the wire over top the leaves, but rather around the branch. Continue adding tree clippings this way, overlapping them and wrapping wire around them and the base of the wreath. Make sure they point in the same direction. 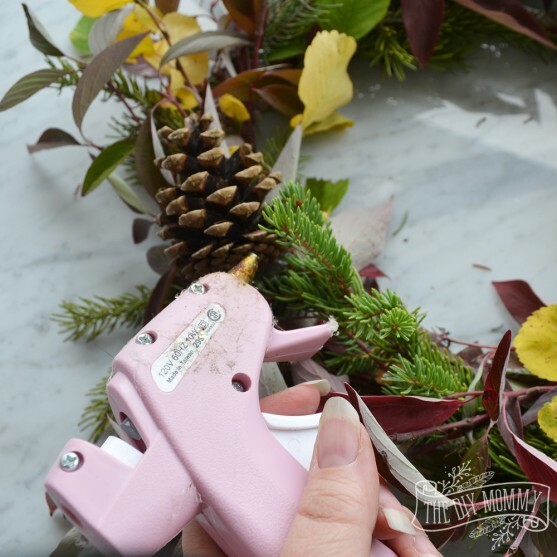 The closer together your tied-on clippings are, the fuller your wreath will look. 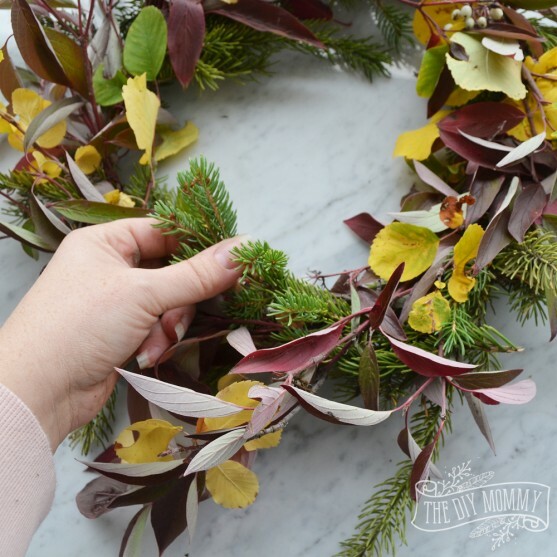 If your wreath doesn’t look full enough when you’re finished adding the clippings, you can stuff pieces of evergreen or more clippings into the wreath in various spots. Play with it until it looks that way you want! Finally you can glue a trio of pine cones on to one of the lower sides of the wreath. I used a glue gun to secure mine, and then I also wrapped floral wire around them. This is what the back of the wreath will look like. And here’s the front. I love how the narrow leaves almost look like feathers! I think the whole effect is just so simple and pretty – it’s a perfect wreath for a special occasion (like Thanksgiving or a Fall party). Mine stayed looking fresh outside for several days. 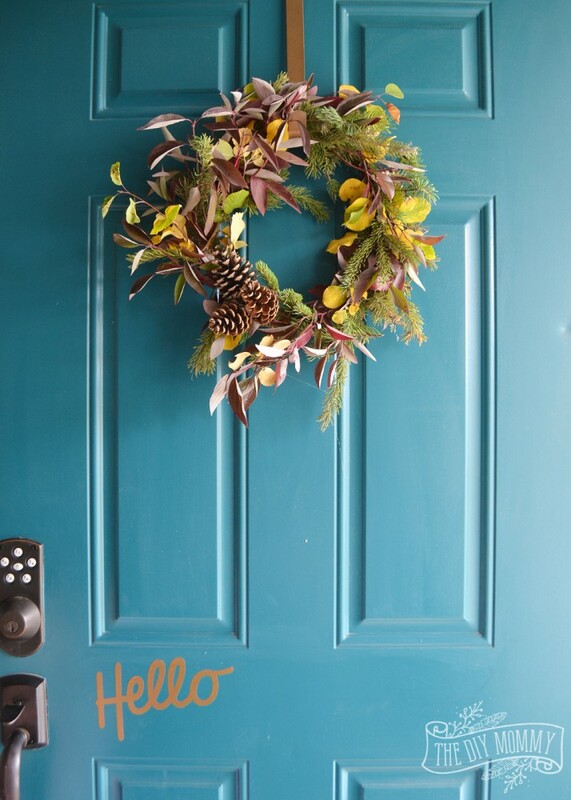 I especially love how this natural wreath pops on our deep teal front door. A group of 14 bloggers are so excited to share a whole collection of wreaths and we hope you feel inspired to create something of your very own! 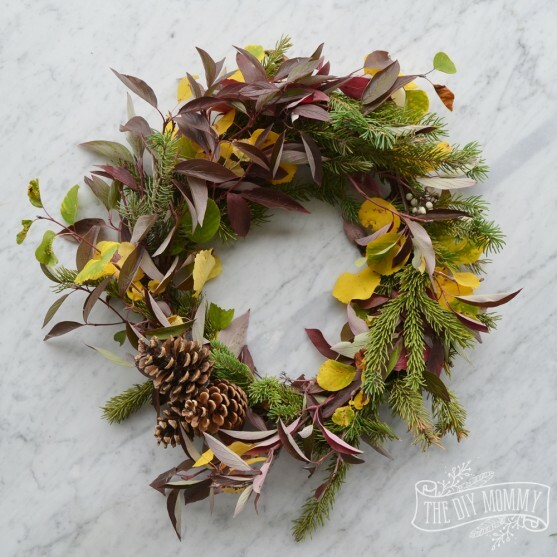 Nature Inspired Fall Wreath From Vin’yet Etc. Looks amazing! I’m a sucker for fresh foliage wreaths, the yellow leaves are beautiful. This is gorgeous Christina! I love how it turned out just using items from behind your property. I also really enjoyed the story behind how you came to make this wreath. What a wonderful way to honour your grandfather and continue a family tradition! So pretty, and I love how it looks on your colourful door. You make me want to go for a walk in the woods and see what I can find! I just love this! I’m so impressed that it’s completely natural- now I feel like I need to give that a shot! Love the fact that it’s free! Unfortunately no foliage near us has turned yet, otherwise I’d love to try yours! Love this!! I love that you foraged everything to make it (including the wreath!) 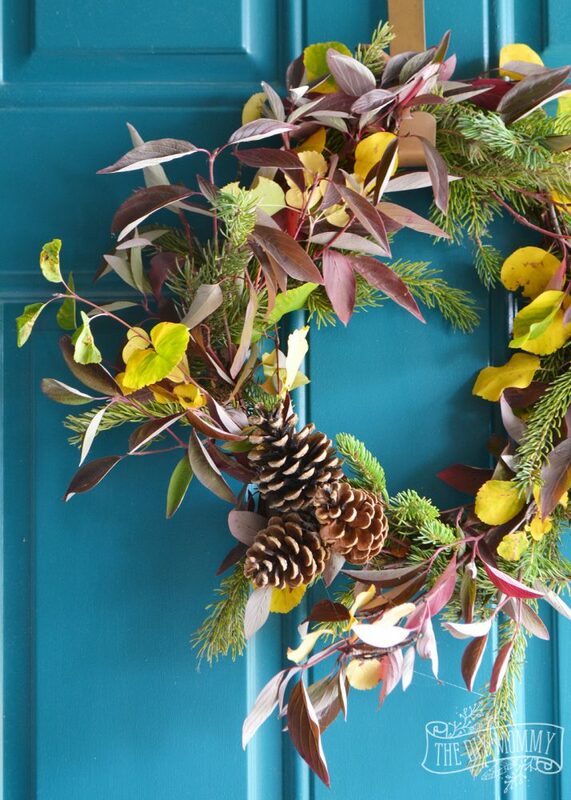 and I love how the wreath looks on your blue door! Stunning! Which reminds me… I really need to paint my front door… Lol. 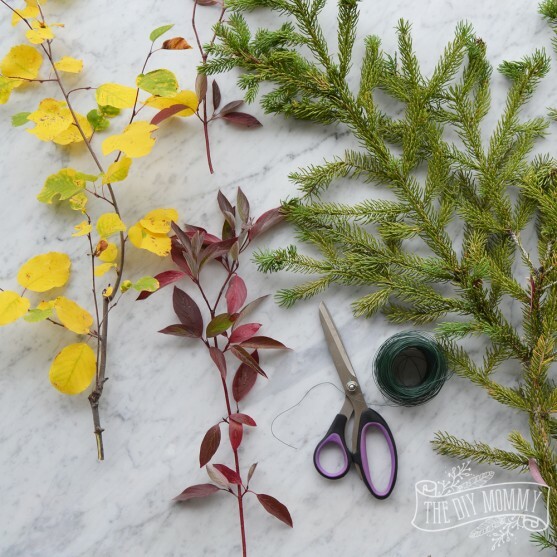 I love the narrow red leaves too, and what a super-fun craft! I bet it smells amazing too right at your gorgeous front door. Thanks for sharing!